This month’s featured resource are the informative and highly readable Linn’s U.S. Stamp Yearbooks. 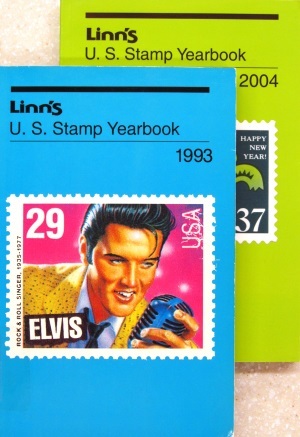 Begun in 1983 as an offshoot of various columns in Linn’s Stamp News regarding each year’s new U.S. stamps and postal stationery, the annual Linn’s U.S. Stamp Yearbooks go beyond the standard, or even specialized, catalog in providing a wealth of information regarding many aspects of each year’s U.S. releases in a convenient and thoroughly illustrated format. In an attempt to answer the “who, what, when, where, why, and how of their existence” [Boughner, Fred. Linn’s U.S. Stamp Yearbook, 1983: p. 5], the first 1983 edition of the yearbook, edited by Fred Boughner, includes all 112 new U.S. stamp issues and other postal items including commemoratives, definitives, airmails, officials, embossed envelopes, postal cards, aerogrammes, and souvenir cards. Each yearbook is divided into sections under each of these headings, then subdivided further by each issue and finally listed by each new item’s date of issue. 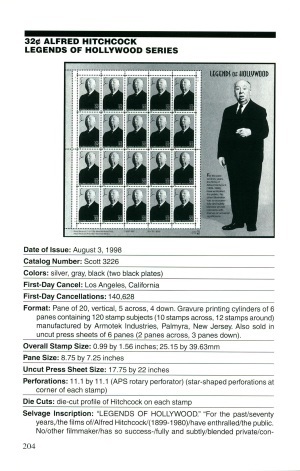 The first page of each new issue section includes a table of complete production information and technical data for the relevant stamp or stationery item including Scott number, date of issue, FDC data, designers, engravers, modelers, printers and printing method, quantity issued, and plate data. Later editions of the yearbooks also include selvage, tagging, gum, and paper production information. Following this initial table of technical data are sections describing the development background and history of the stamp or item, its design (in some cases showing various stages of the design as well as some rejected designs), production history, first day facts, and any known varieties. Unfortunately in 2010, Linn’s produced its last Linn’s U.S. Stamp Yearbook citing publishing costs and a shrinking marketplace. Regardless, these yearbooks are still considered one of the best resources for “a comprehensive record of technical data, design development, and stories behind all of the stamps and postal stationery issued by the United States Postal Service” [Amick, George. Linn’s U.S. Stamp Yearbook, 2010: p. 1], between the years 1983 and 2010. All 28 editions, 1983 through 2010, are available for further research through the APRL and can be borrowed, or smaller sections can be photocopied or scanned. See the Library Services page for a schedule of fees and services provided in order to access these remarkable compilations.